Just like the name says, town games are played in towns or villages. When playing these games, you must take care that everyone watches out for traffic and that no-one runs over the roads. A member of staff should accompany younger members of the group or during a camp. Within a specific amount of time, each group must collect as many stamp prints as possible. Who has the most different types of stamps? You will need some sheets of white paper. Specific tasks must be solved and questions must be answered (questions on the town, history, people). It is necessary that you know the town well and have people who you can ask the answers to questions. An unknown Mister X must be found. Every now and again, the group receives tips by mobile phone texts. You should ask ….for more information! You will find more clues at point A! A person with a flower in their buttonhole can help you! Mister X has just been seen in …..street! Spilt the group into teams of equal numbers. Each team receives the same object. They must try to swap this item against something bigger or better from members of the public. The new item may now of course be swapped for something else. Whichever team has the biggest or best object after 2 hours has won the game. The objects must remain the property of the group – not that someone makes a great deal but must return the item. A group who does this does not win the game. Questions for the local church. History, founding, name of the father, baptism altar, number of pictures in the church, stories represented in the church windows, number of steps to the bell tower etc. You can also involve people who belong to the church in this game (church community representative). The youth group is split into 2-3 teams and each team is given a camera with film (a digital camera would be even better). The functionality of the photos will be explained. You should remind the kids about traffic dangers. The task is now to take 30 pictures within a specific amount of time (90 minutes). Points are awarded for each picture. Which pictures should be taken? How many points are awarded for which photo? Are there bonus points available for particularly original photos? Each group receives a task list with possible images. 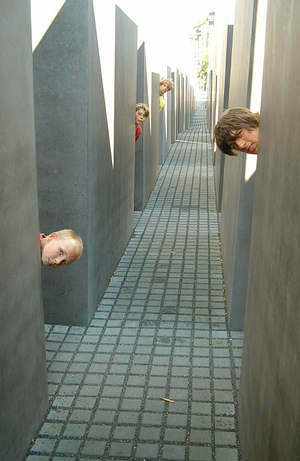 In addition, the group has the possibility to think up other good images or to discover some spontaneously on the way. Depending on the local conditions and the difficulty of the photo image, different points can be awarded. There are bonus points for spontaneous photos, depending on the level of creativity. The number of the photo (according to the camera) should be written on the list next to the task, so that the photos can be correctly sorted once developed. The extra photos should also be given a number and a title. It obviously works more simply and quicker with a digital camera or a mobile phone with a camera. Most kids today gave such a mobile phone. Then the pictures must simply be transferred onto the computer. You can make a wonderful photo album from the pictures. Identical twins, but not people from the group! Further scenes and images chosen by the group. Each picture will be given a title. An internet rally can be played in different ways. During the group time if at least 2 computers are available or the group splits into 2-3 members households where an internet connection is available. Outside of the group time, within one week, over two meetings with several rounds. In the headquarters of Scotland Yard there is a wanted poster. Many agents have spread out across the town and are hunting Mister X-net. Mister X-net is an unknown member of the group or member of staff, whose identity is a secret. X-net leaves tracks on the internet. That means he must register an entry in a guestbook (depending on local availability) every 10, 20 or 30 minutes. He must enter his whereabouts at that moment in time. The headquarters now contacts the agents and tries to disperse them in the area (mobile phone or computer) As Mister X-net is already on the way to his next position; he must go past the group. In order to recognise Mister X better, he could leave a clue in his first entry (yellow scarf, hat). Mister X must walk to his next position (no bike – no car) or Mister X must inform the others of his transport method (allowed: bike, scooter, and skateboard). This game does require a few preparations. The game leaders and Mister X-net agree on where he should leave his trails. Enough other people must therefore take part (club members) who also have access to the internet and have their computer connected up. The youths could also discuss who has access to the internet and how they are going to communicate their findings. Mister X must be caught, so you will need a couple of players on the streets. X-net is caught as soon as his identity is worked out (send the name by e-mail to the group leader!). The groups are given tasks which they must solve. The information on how to surf further on the internet is given once a task is solved, or the tasks are already entered in the guest book. The tasks can obviously also be written on a piece of paper. Then there can be no mix up in the internet jungle. The winning team is the team who makes their guestbook entry at the target. The internet address can be made up by using the letters of the solved tasks. This is actually nothing more than a quick quiz. It is a combination of rowing regatta and a quiz. Just like the above but split up over a number of days. A new clue is given every day at a specific time. The task is written in the guestbook of the club’s homepage. In various stages, the players can now try to find the first solution. Who will be the daily winner and is the first to enter the answer in the guestbook or send an e-mail? With this variation, only members of the group can be invited to play (insider knowledge) or you can include other kids who are (not yet) members of the group. Depending on who should play the game, you will have to promote the game first of all. The daily or weekly winner receives a prize in the next group meeting. Dependent upon the number of players, the group is split into teams of 2-5 all with the same number of players. Each player receives a sign with an individual initial pinned on his back. The sign should be readable at a distance. The initials make up an address (e.g. RS9 for Rail Street No. 9). Each Mafia clan receives a list on which the initials are written out. With must call at the doors of the players with the addresses and receive a piece of paper with a clue or similar. During the game, each group tries to find out and steal the addresses of the other clans without giving away their own address on their back. The players should therefore sneak along with their backs to the walls, cross the streets quickly and lean against fences in a „bored“ manner... It is not permitted to use brute strength to find out the addresses. That means that touching other players is not allowed. The difficulty involved in playing this game, is to find enough families who are willing to give out the tasks/clues. One family should be found per player. The tasks/clues must also be thought up. The last time we played this game, the result was that all players who had still managed to keep their address a secret met up and laid themselves out on the street while the others tried to coax the address from under them. It was really funny. You can also think up a good story to fine tune the game. This game idea was sent by Matthias Zimmer (EC-Sulzdorf, Germany) in December 2003. For this game you will need a „Mr. X Group“ (2-5 players) and between one and three “Tracking groups“ (each with 2-5 players), as well as a person working the telephones. The whole things is not only played in a town, but in a whole area linked by public transport. They are usually group tickets for small groups which makes the whole thing more financially manageable. The Mr. X Group sets off by train/tram/subway and must call the telephone exchange every 30 minutes to inform them of their whereabouts (or give them the train station which they passed last). Depending on how often the trains depart, the tracking group sets off half an hour (15 minutes) later, calls the telephone exchange every 20 minutes and also gives their position. The telephone exchange has the job of networking and passes the information onto the groups. The groups are only allowed to move around inside the train stations and on rail property. (You can set your own individual rules if required). You could theoretically use bus transport as well but the game would almost become impossible. The length of the game is variable, but should take at least 3 hours. The times (setting off, calling the exchange) should be related to the location, groups and possibilities available. In some areas the trains only depart every 60 minutes and in other areas, every 10 minutes. It is an option to build in incident cards. For example: The signature of the kiosk worker at the southern train station, finding something (bag of sweets for example) or give a stranger (insider) information to be passed onto the following groups... there are no limits to your own creativity. I thought of this game once for a church youth session and it was well received. At the beginning of the hour I showed the children a picture of the Rosetta Stone and explained that on this stone the same passage of text appears in three different forms; as hieroglyphics, with Demotic script ( a type of Egyptian script) and classical Greek. With the help of the name Pharaoh appearing in the Greek script, Champollion was the first to succeed in deciphering the ancient Egyptian script and to subsequently draw conclusions about the language. Then I split the children into two groups, one group represented the tribe the „hullabaloos” and the other a research group who were on the track looking for these indigenous people. The research group was sent into a different room whilst the Hulabulas devised their own secret script in which they were to write a message for the researchers. The important thing is that each letter of the alphabet appears at least once. They should write the same text underneath in normal letters. After this the Hulabulas set off, and at each junction left a note with a question written in their secret script which, if answered correctly reveals the direction in which the Hulabulas have gone. Meanwhile, the researchers attempt to decipher the script and to compose an alphabet of the new language. With the help of this alphabet they try to follow the Hulabulas and to find the place to which the natives will go at the end of their journey. A contribution from Lisa F.
Questions are posed e.g. „How many windows does the town hall have at the front?”. With sheet of paper of at least 5-10 questions (depending on the time), the participants set off in two groups. The group who brings back all the answers to the location where the team leaders are, wins. Material specifications are one pen and 1-2 pieces of paper per group. Each group leader disguises themselves as a window cleaner, tourist or Punk etc. The leaders are assigned a pre-agreed city area and stick to this area (shops, bars, cafes, banks...). Each leader has small notes with their signature on it. The participants split themselves into groups and wander around the city trying to collect the notes with signatures on; in doing so they have to recognise the leader and tick them off. Running away should not be permitted so as not to provoke thoughtless ‘running over the road’. The supervisors disguise themselves during the explanation of the game, and hide in set places within the area (possible within companies/shops [seek prior permission from the owners]). The task of the children is to find the supervisors, and to describe their disguise. The supervisors are not allowed to be spoken to directly i.e. should not answer questions. A question should be hung nearby to the supervisor ( to the Lager or person present), which should be written down and answered by the children as an additional task. Per disguise item, 1 point should be given ( a maximum of 5 points per supervisor) Per question found, 1 additional bonus point should be given, if answered correctly, 2 points to be given.